Each year, the computer world stops and takes a moment to take a glimpse into the computer technology of the upcoming year. Each year, this event takes place at nearly the same time at exactly the same place. Boasting an attendance of about 250,000 electronic component buyers, sellers, and just plain enthusiasts, the event is not one to be missed. This event is Comdex. Some has changed since Comdex got its start quite a few years ago. No longer is Comdex an OEM show, but it has become more of a consumer show. And with booth prices constantly rising (many companies pay $50,000 or more for their 5 days of floor space), some have started to question the importance of perhaps the largest trade show in the world. With things slowly turning around for Comdex participants, the organization of the show plans to change to a more OEM atmosphere, bringing the show back to its roots. Regardless of how the show is conducted or how much floor space costs, there is no question that Comdex remains the one time in the year where companies strut their stuff. Attracting everyone from the behemoth Microsoft to many companies trying to get their name on the map, Comdex is not a show to me missed by companies or buyers alike. For those out there who could not make it to the show this year and were stuck watching the R2D2 look-alike robot on CNN every 25 minutes, we bring you a summary of the events and products seen at the show that do matter. 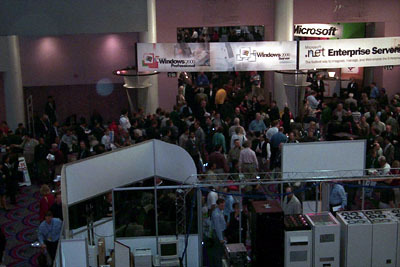 A view of the show floor.